First things first, Ben, I became aware of your work via your book The Sea Rover's Practice: Pirate Tactics and Techniques, 1630-1730, which is in a word-superlative! Exactly the sort of hands-on in-the-trenches history that appeals to me. I love the immersive aspect that goes beyond the typical academic rehash. Your work feels alive and passionate and “been there, done that.” History as experiment as opposed to comfy chairs only. For those not in the know, Ben has fired the period firearms, he knows his seamanship, he has handled the swords. Let me ask, how important to you is it to make this history come alive via experience as opposed to cobbling together yet another “Here’s what someone else wrote” account? Your question points directly to the intersection of several issues in the study of history, or for that matter, even to the present in understanding another culture or set of behaviors. There must be some reference for common understanding. For me, the baseline has always been that people are people, that fundamentally we’re the same. However, this “sameness” diverges the more we look at culture itself, as opposed to human nature, and even more so when it comes to specific techniques and, in the case of military or quasi-military operations, tactics. The fundamentals may remain the same over millennia but the expression will change to a greater or lesser degree. 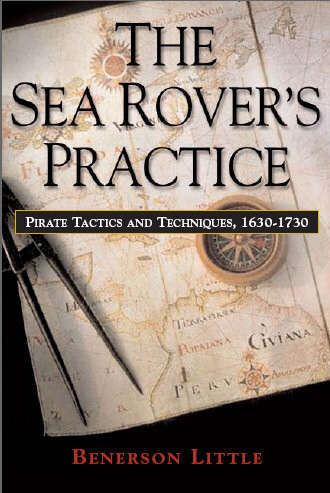 In sum, to understand sea rovers, for example, it’s necessary to understand their environment—the sea—as well as how and their purpose—profit by force of arms on the sea—affects their behavior, as well as their tactical and technical expression, so to speak—how they managed their arms, &c.
I immediately saw numerous similarities in attitudes and behaviors between Navy SEALs and sea rovers in general (and in particular, those who were quite competent—not all were), for example, and this permitted me to see behaviors that some scholars either missed or ascribed to other reasons than I might. Bearing arms leaves a behavioral imprint, as does bearing arms at sea, as does bearing arms at sea unconventionally. It doesn’t matter that Navy SEALs or a group of sea rovers is composed of diverse personalities: the trades or professions leave a particular mark. In the past, for example, I could pick out with a high degree of accuracy Navy SEALs in civilian clothes, simply by recognizing subtle signs. It didn’t matter that all might be dressed differently, or have different accents, and so on. Their profession was imprinted on them. To understand sea rovers, it helps to have boarded ships, to have been trashed in the surf and nearly drowned, to know first-hand how easy it is for the sea to kill you, to know first-hand how it is for a plan to mislay, to have hallucinated from sleep deprivation and dehydration, to have gone without food on a desert shore for a day or a few, to have had your hands swollen so much from seawater and sunburn that you can’t close or open them all the way and you have small cuts and cracks in them from the swelling… It helps to have seen how men behave under life-threatening pressure, especially when everything is going wrong. There are plenty of opportunities for such experience today, which once was common: most people just don’t take the chance to get it anymore. A simple example: in a recent online discussion about pirates and whether they wore rings, I don’t think anyone brought up the practical until I did: that rings on hands shrunk from cold seawater will slip off, that rings on hands swollen and macerated will cut circulation off, that rings can get caught on the various machinery of a ship and you may lose the finger. Practical experience matters, and even modern similar experience is important. Too often I’ve seen scholars miss the obvious in the study of piracy, for two reasons: an ideological approach that causes them to cherry-pick facts (pirates were rebels against empire aka the Star Wars and Black Sails approach, pirates were rebels against corporate overlords aka the Marxist approach, pirates were really cool knights of the sea aka the armchair historian approach), and a fundamental lack of understanding of the sea, of ships and men, and of the use of arms past and present. For example, I was involved in a pirate documentary some years past, and during a break in shooting I was talking to the producer’s assistant who was former Navy, and also to one of the props guys, likewise former Navy, a Brown Water sailor (gunboats, riverine warfare) during Vietnam. No matter the years between our service, we all spoke the same language and were shooting the sh*t as Navy men do. One of the other guest experts was a professor who studied seamen and maritime labor of the past, and I noticed he was watching and listening to us with rapt attention, almost as if in reverie—and with a huge grin. Here he was, watching Navy people talk and act as they really do. I realized at that moment that most scholars, no matter how good (and this professor really knew his subject) are looking from the outside in. They will always miss something by not having at some related inside experience. In sum, if you want for example to know how buccaneers and boucaniers managed their long-barreled muskets, you must (1) research everything you can about the firearms, then (2) go into the field and test fire them, using every technique you’ve read about--a few hundred times at least. Only then will you begin to appreciate the weapon. I once read a piece by a scholar who was trying to prove that Native Americans took up firearms not because they were superior to bows and arrows, but for cultural reasons. However, numerous period accounts, my own tests, and tests by other modern experts in period arms prove the contrary. (Morgan’s buccaneers were fired on repeatedly by Native Americans allied with the Spanish while crossing to Panama—but they were largely ineffective, brush and branches deflected most.) The difference between the reality and the scholar’s argument? The scholar fired a musket a few times under supervision, then imagined all sorts of reasons the bow was actually superior, including the “fact” that the flight of incoming arrows might terrorize firearm-toting militia and so forth. Had he served in any ground combat arms, or even done some reasonable research, he would know what any veteran troops or simply well-trained ones would do in such a circumstance, just as they do today when they spot incoming tracers: know immediately where the enemy is and engage him. Such absolute nonsense of the sort presented by this scholar is common in much scholarship (but certainly not in all, not by any stretch), and is one of the reasons I go to primary sources as much as possible, and then whenever possible test what I’ve read, preferably in the field. Too many times have I read a scholarly argument only to find that the scholar’s sources don’t actually support his conclusion, sometimes because he or she hasn’t actually tested them, sometimes because he or she has cherry-picked or even deliberately misread or ignored facts. I could on and on here, but will cut this short with one more example. There are a lot of reasons the “Jolly Roger” may have gotten its name—people forget that naming and such is often synergistic, and that a name may have more than one origin. Even so, some scholars don’t see how the fact that one of the definitions of roger, that of—to be polite—copulation and to copulate, could have anything to do with the name of the flag. And indeed, roger had several meanings, all of which could apply. Yet I can tell a group of sailors that roger meant copulation and to copulate (I’d use the usual vernacular, of course), and they’ll get the joke of the jolly roger immediately. Cultural and physical context matter! What they get right, sometimes, is the chaos of close combat in the confines of a ship’s deck, and the combination of courage and fear that accompanies it. Most everything else is, unfortunately, incorrect. Foremost, although there were hand-to-hand combats on open decks, often between the crews of men-of-war, most combats, if at all lopsided in numbers, were fought by the defenders from “closed quarters.” That is, they retreated to barricaded bulkheads and fired muskets from loopholes, cannon from bulkhead ports, and threw grenades from loopholes. Further, the decks were often mined by half a dozen or more “powder chests” designed to be blown up as boarders leaped onto the decks. For the boarders, their job was to suppress enemy fire long enough to chop and holes into bulkheads and decks (from which the “boarding ax” has its name) and, using iron crows, pry up planks, in order to make openings into which were thrown grenades and firepots to flush the enemy out. These combats could take an hour or even several, and often were unsuccessful for the boarders. Boarders in these sorts of closed quarters combats were not only armed with cutlass and pistols, but also with muskets, cartouche boxes, and often boarding axes and grenades. John Smith, of Virginia colony fame, described these as the most brutal of all combats, worse even than fighting in the trenches. The swinging from lines onto enemy decks or from aloft is Hollywood nonsense, although it looks spectacular. Boarders generally carefully leaped from their forecastle to the, usually, main shrouds of the enemy. It was not the process of a mere few seconds as we see in Hollywood, but a much longer one. Even the lining of boarders up on the gunwales, all of them waving cutlasses, is Hollywood—to do so in action would be a good way to get killed. This was probably done by early 18th century pirates against an intimidated merchant enemy who would not fight back, but it would never be done against an enemy who was fighting back. Basically, boarders kept under cover as much as possible until time to board. The attacking ship would keep up a constant small arms fire in order to suppress enemy fire, then would lob grenades onto the enemy deck in an attempt to clear them, and if not clear them then at least provide the opportunity to briefly suppress enemy fire and provide a smoke screen of sorts under which to board. The accounts of combat on open decks typically describe incredibly brutal close combat, with pistols fired at close range, often in contact with the enemy, and cutlasses and other armes blanches in great use. Although cutlass, pistol, boarding ax, and boarding pike are the most commonly cited weapons in use, the musket, often with bayonet, was in common as well, as were, but to a lesser degree, the brown bill (English bill, black bill) among English seamen and the partisan among the French. I’ve even read accounts in which round shot (cannon balls) were flung onto boarders, crushing skulls and breaking other bones. These were bloody, brutal actions. Getting back to the cutlass, there would be little time or room for protracted fencing engagements as in a duel, and which we often see in Hollywood. The chaos of such an environment is almost unimaginable: a variety of weapons in use, the danger to one’s own people from their own weapons, threats coming from all sides… Although there were probably some “knife sharpening” cutlass actions of attack, parry-riposte, counter-parry-riposte, most cutlass engagements probably ended with the first attack or the first parry-riposte, and many engagements probably including grappling. I imagine that the cutlass was often used as a supplementary weapon, or as part of a weapons system of pistol-cutlass: fire the pistol at the enemy, then cut him down. It may have been often used to deliver the coup de grace as much as to immediately dispatch an active combatant. Hollywood shows the cutlass generally in use as if attackers and defenders squared off one by one: one attacker and one defender engage in single combat, with both crews divided up this way. This doesn’t appear to have been the case, although there were some single combats during such actions. A famous French privateer even captured a ship after engaging its captain sword-to-sword. But this was the exception, not the rule. In other words, the cutlass was but one of several arms of equal value in boarding actions. First, thanks for the compliment! Part of this I’ve already covered in my answer to your first question, but yes, absolutely, I feel—actually, can prove—that much historical writing, both fact and fiction, is unrealistic, often highly so, with no basis in the real world. Certainly not all is, but there is enough unrealistic writing that it taints the pool, so to speak, and promotes fiction as fact. I’ve seen this in fiction too. A few years ago a critic correctly pointed out that much television and film was unrealistic because the writers had no real life experience in what they were writing, but instead took their experience from bad television and film—taking pure fiction as fact, in other words, not only in technical details but in behaviors. I’ve seen this first-hand on occasion in both non-fiction and fiction as well, even having to point out twice to editors that what I wrote was based (1) on research, on documented fact, and (2) on my own first-hand experience. They were relying on bad history and bad novels—clichés—as fact, and trying to argue with me about it. However, for me the reality is exciting, even more so, than the fiction. But people in general don’t like to give up their notions of “reality,” no matter how incorrect, and these days, with Internet access and the ability to easily post opinion as fact, far too much nonsense is passing as truth. If you want to know what something is really like, you go directly to the source if you can. You want to know what sword combat was like in the late 17th and early 18th century? Read Donald McBane’s book, the man was in dozens upon dozens of duels, affrays, and battlefield fights. He knew what he was talking about. When I went through BUDS, most of our instructors were Vietnam combat veterans, and likewise they were when I went through the SEAL Team ONE and SEAL Team THREE platoon training (ST-1 trained ST-3’s first two platoons). I listened to them! When our ST-3 command master chief, a man with seven combat tours in Vietnam and two Navy Crosses, pulled me aside as a young Ensign to give me advice, specifically not to f*ck up as the PL (patrol leader) because I’d be dead if I did, not to mention get some of my people killed, by using the example of the three times he was ambushed and in all three cases the first two or three in line got killed (point man, PL, RTO…was the patrol order)—I listened and learned. I didn’t ignore fact and substitute romantic Hollywood illusions. The goal of research and investigation should be the truth, no matter where it leads. This was easy in the Teams: fantasy would get you killed. I’m not sure I can state a single likely appeal to sea roving or any other risk-taking enterprise. It’s a fact that many, maybe most, people imagine themselves undertaking adventure—by definition risk-taking—yet most never actually do (although I highly advise they do, at least once!). Certainly the idea of adventure itself is a strong reason. Likewise the idea of throwing off of the mundane, of the ridding oneself of the “middle class mentality” so to speak, is a prominent reason, as is the idea of “getting rich quick” while having fun, even though most never got rich, much less quickly, and sea roving often wasn’t much fun at all. “Need and greed” has been identified as two of the predominant reasons since antiquity for sea roving, but even in these cases a sense of risk-taking and adventure probably often enter in, at least to some degree. In the Teams I knew men from all walks of life, of many philosophies, of varied backgrounds, of many different social and political inclinations, yet we were all bound by senses of adventure, duty, and teamwork. No matter how law-abiding some of us might be—frankly, I would probably have been a pirate hunter in the early 18th century, which is still a form of sea rover in fact—we all have somewhere deep inside of us, at least those of us who would adventure, what you so aptly described as a “felonious nature” of rule breaking. Mencken said it best: “Every normal man must be tempted, at times, to spit upon his hands, hoist the black flag, and begin slitting throats.” I’m not sure I can explain it, but I fully agree. “The following passage regarding “handy grips” appeals to me greatly due to my area of major interest. Unfortunately, there is almost no information on sea rover hand-to-hand, or even cutlass-play during the so-called Golden Age, roughly 1655 to 1725. A few journals note some cutlass-play, from which a few things can be deduced, but there are no cutlass manuals. There are a few hand-to-hand combat manuals from the period, so it’s possible that some seamen were familiar with them. Wrestling and boxing were popular, so surely some sea rovers were adept at these practices. I’ve seen some secondary sources that note that French la savate had its origins among early 18th century French seaman who practiced something similar. We do know that there was formal practice in swordplay aboard some sea rovers, and almost certainly informal as well—there was in the land forces. We can infer that there was probably similar instruction in hand-to-hand as well, but there really isn’t anything discussing it per se in any sea roving primary sources I’ve seen. Dueling was not accomplished, at least among most sea rovers, by wrestling, boxing, or knife-fighting (the Dutch may be an exception to this last, I’m doing a blog post on it soon), but by sword (usually cutlass, occasionally smallsword among some officers), or sword and pistol, or fusil boucanier among the boucaniers (hunters of Hispaniola). I’ve probably touched on this already above, possibly even answered it already (I tend to wander to associated subjects in my answers, as you can tell), but yes, definitely, my experience has made it much easier for me to see how seventeenth century maritime tactics, in particular boarding and other close combats, were actually accomplished. The problems to solve were much the same as they are today: how to keep equipment dry, how to gather intelligence, how to make a plan, how to surprise the enemy, how to deal with the vagaries of the sea, how to deal with the fact that sh*t happens in spite of the best plans, how to keep order before and during a fight, and so on. The sea has its own unique set of problems: those fighting on or from the sea must deal not only with the enemy, but with the quite unforgiving environment. I’m sure I would’ve made far more mistakes in researching and writing books on piracy and other sea roving had I not had the experience with SEAL Team that I did. Things that seem obvious to me might not even occur to scholars without hands-on experience of arms and the sea. I’ve seen a lot of errors in regard not only to maritime warfare of the period, but also to seamanship in general. Regarding piratical swordsmanship do you have an insight as to what “style” or schools might have held preponderant sway? Cutlass play of some sort appears to have been the predominant form among most privateers, with some exceptions I’ll mention first. 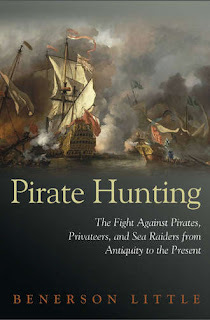 Foremost, Spanish sea rovers were often equipped with the rapier and poniard, these were the almost mandatory weapons, into the early to mid-18th century, of Spaniards who considered themselves as hidalgos—and a great many did. 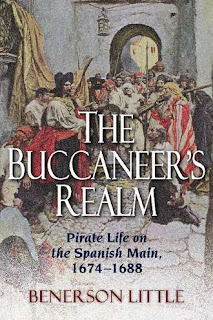 The only eyewitness image of a Spanish pirate shows him with a cup-hilted rapier at his side. The cutlass was also used by Spanish sea rovers, of course. Second, some sea roving officers probably carried the smallsword, possibly in action, certainly ashore. A small but significant number of French flibustiers were French gentlemen—Michel de Grammont, Raveneau de Lussan, the sieur d’Hulot, the sieur de Chauvelin, among others—who probably carried a smallsword, at least ashore. Among some French privateer officers I’ve seen the use of the cutlass at sea and the smallsword ashore. In these cases of rapier and smallsword, it’s fairly easy to determine the swordplay involved, given the large number of extant texts. However, I will note that few fencers even today follow any school exactly. More often, elements of a particular school are adapted to a fencer’s physical, mental, and tactical characteristics. For the most part, though, it’s the cutlass that prevailed. Unfortunately, as I’ve already noted, we have no extant cutlass manuals and only a few vague descriptions of the cutlass in action. The assumption is that it resembled common practice of cutting or cut-and-thrust swords (and some period commentators even suggest this), of which there were several or more schools (for example, English, Highland Scottish, Hungarian, German, &c., all with some overlap as well as some distinct characteristics). Notably, the breadth of technique with a cutting sword is finite, so there was probably a lot that was common among various practitioners. What’s often missed in cutlass discussion though is (1) that at close quarters aka “handy grips” at which the cutlass was often used, the cutlass can make devastating cleaving cuts (I’ve tested them on a variety of targets), and (2) can be used to make almost single tempo counter-actions in contact with the adversary’s blade (aka “grazing” actions) much like some of those of the German Dusack (I’ve tested these too with a friend). I’d be very surprised if these actions weren’t taught or used, they come about quite naturally with a little bit of practice, including cutting practice. 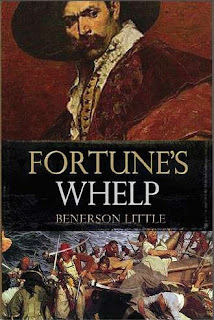 I’ve a chapter on period swordplay in The Buccaneer’s Realm, another on dueling and cutlass play in The Golden Age of Piracy, and a blog post on the buccaneer cutlass here, which includes some information on what know about how the cutlass might have been used: https://benersonlittle.wordpress.com/2016/12/31/buccaneer-cutlasses-what-we-know/. There are a lot of great books on the subject, far too many to even begin to list here (and therefore any authors not listed here should not take offence!). Note that the following are all secondary sources. I highly recommend going straight to primary sources, they’re where I got my start. Secondary sources can help fill in the blanks, or put things together if you don’t have literally years to make your own slow study. Anything by Peter Earle, he’s a very fact/reality-oriented scholar. I like Peter R. Galvin, a lot, his Patterns of Pillage is a great description of how geography affects piracy (and everything, in fact). For Spanish speakers, Corsarios y Piratas de Veracruz y Campeche by Juan Juarez Moreno, it’s easily one of the best books on piracy, ever. Great discussion of Laurens de Graff and others who attacked Mexico in the late 17th century, very well researched, heavy on Spanish sources, very fact-oriented. 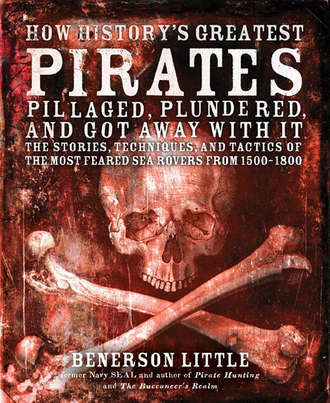 I wish more books on the subject of piracy were like this. David F. Marley has done a lot of great reference work on the subject. Captain Blood: His Odyssey by Rafael Sabatini. There are two associated books of short stories, The Fortunes of Captain Blood & Captain Blood Returns. The Black Swan by Rafael Sabatini. The Pirate by Sir Walter Scott. Howard Pyle’s Book of Pirates by Howard Pyle. Frenchman’s Creek by Daphne Du Maurier (a romance, but great insight into the ideal of a pirate captain’s mind, based on her husband I think, he was a professional soldier). Adam Penfeather, Buccaneer by Jeffery Farnol, prequel to the following two novels. Black Bartlemy’s Treasure by Jeffery Farnol, really part one of a longer novel, part two being the next book. Martin Conisby’s Vengeance by Jeffery Farnol. Winds of Chance by Jeffery Farnol. Again, all have some issues with historical accuracy but are still enjoyable. There still has not been a pirate film or TV show more than fifty percent accurate to date, with the possible exception of Treasure Island starring Charlton Heston. More than anything, these are simply my favorites in the genre. 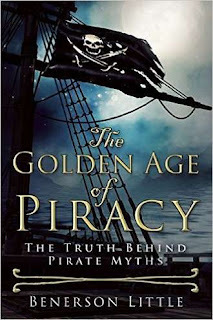 Most are responsible for maintaining many of the pirate myths in our culture. Captain Blood, 1935, starring Errol Flynn. Frenchman’s Creek, 1944, starring Joan Fontaine and Arturo de Córdova, it’s one of the few pirate films to actually show a plan and associated tactics in action. The Sea Hawk, 1940, starring Errol Flynn. The Black Pirate, 1926, starring Douglas Fairbanks. The original that set the tone for the genre. Black Sails (full disclosure: I was the show’s historical consultant). Anne of the Indies, 1951, starring Jean Peters. Many of the details are fairly accurate, and ?? swordplay is the equal of (maybe superior to) the best male swashbuckling actors. Against All Flags, 1952, starring Errol Flynn and, wielding an excellent sword, Maureen O’Hara. Treasure Island, a 1990 TV movie starring Charlton Heston, probably the most accurate pirate film made to date although that’s not necessarily saying much. The Buccaneers, an old TV series starring Robert Shaw. Many of the details are accurate in spite of the lightweight fare. The historical consultant gets an A. The Black Swan, 1942, starring Tyrone Power and Maureen O’Hara (without a sword this time). Honorable mentions, but with little piratical accuracy: The Spanish Main, 1945, starring Paul Henreid and Maureen O’Hara (without a sword, again) and The Crimson Pirate, 1952, starring Burt Lancaster. A couple of very guilty pleasures: Cutthroat Island, but only for the soundtrack and Geena Davis swinging through the rigging with a sword like Douglas Fairbanks, and Pirates! starring Walter Matthau, mostly for the sets and costumes. I’m at work finishing Fortune’s Favorite, the sequel to Fortune’s Whelp (Penmore Press), and should start work on the final volume in the series soon after. If these work out, I’ll both continue the adventures of Edward MacNaughton afterward, and go back to his beginning in the Caribbean as well. The books tell the story of a Scottish privateer, formerly a buccaneer, returning to the Caribbean as a privateer in the 1690s. I’m also shopping a non-fiction proposal around for a book looking into the origins of the real pirates behind Captain Blood, as an excuse to look into, and riff upon, everything from modern culture to historical errors, from the law to publishing to sword-collecting, you name it, and so on: The Hunt for Blood’s Buccaneers: Riffs, Rants, and Reflections On Pirate History and Modern Culture. 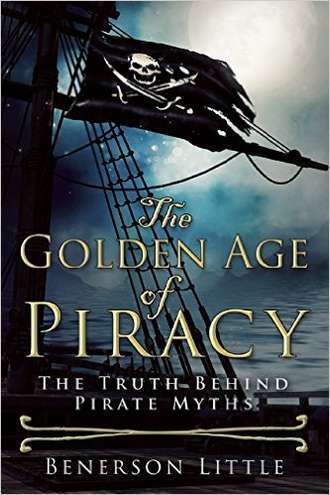 I’m also shopping a short novel for middle readers (absolutely nothing to do with piracy), and my wife and I working on another novel for middle readers, again nothing to do piracy but for a little bit of swashbuckling. I continue to consult for Firelock Games and their historically accurate Blood & Plunder tabletop wargame, plus some other things they have in the works. Ben, again, thank you for taking the time to have this chat. I have found your work exhilaratingly inspiring. It is just the sort of immersive approach I seek in the Rough & Tumble side of things. Thanks for the information and the inspiration!